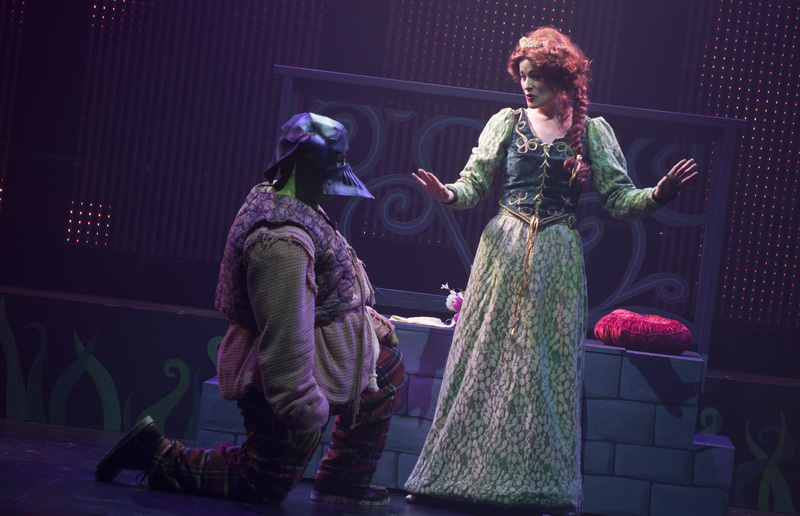 We sat down with Michelle Nash and Andrew Di Rosa to talk about life after theatre school, the impact of theatre for children and their dream roles coming to life in The Lower Ossington Theatre’s current production of Shrek The Musical. BK: This isn’t the first time the two of you have met? MN: No. We went to the joint Theatre and Drama Studies program at the University of Toronto Mississauga and Sheridan College but we were in two separate years. BK: Have you worked together before? MN: We worked in the University’s Erindale Fringe one act festival in a musical actually. But we’ve come such a long way since then. 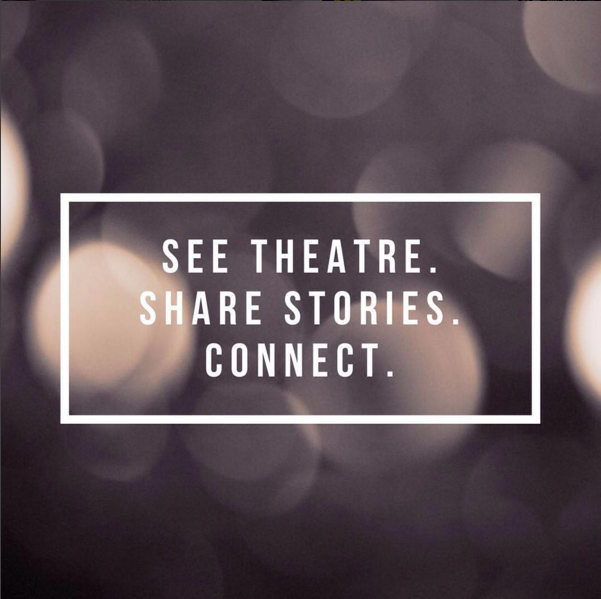 BK: What about life after theatre school? What has happened between graduation until now? MN: It’s been a year and a half since I’ve graduated. I’ve been doing a lot children’s theatre. This is the first big tech heavy, cool show I’ve gotten to do. It’s been pretty amazing being out of school. You settle into life. I feel like I’ve learned more about acting this past year, because of life experience and the practicality that allows you to apply what you have learned from school to the real world. The more shows that I do, I find, the better I get and the more comfortable I get when things go wrong, which they always do. That’s theatre for you. ADR: I’ve just graduated. Right out of school I got a feature film from Theatre Ontario, which I did in August. That was a huge step for me because I came out of school trained heavily for theatre. 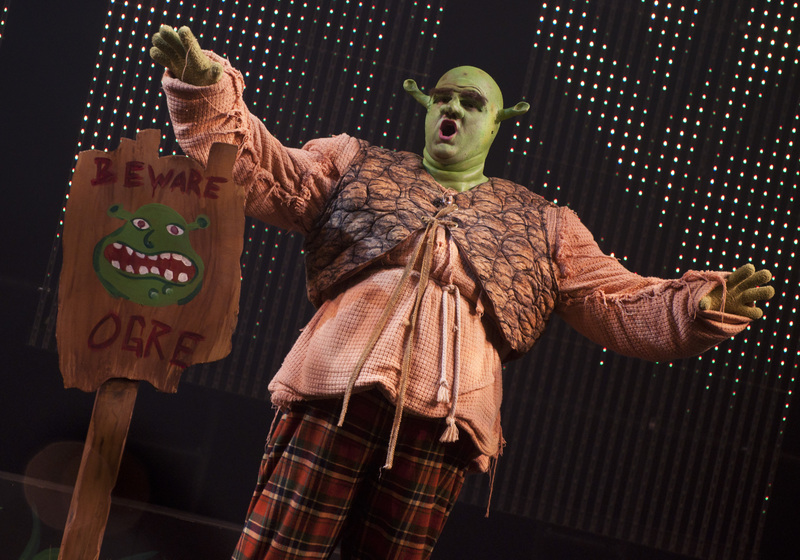 I remember the director had to pull me aside and say “Hey, this is a movie now… take it down a bit.” That was a tough struggle trying to navigate those two mediums but coming back into the theatre world with Shrek was like home territory for me. It’s been such an incredible feeling. 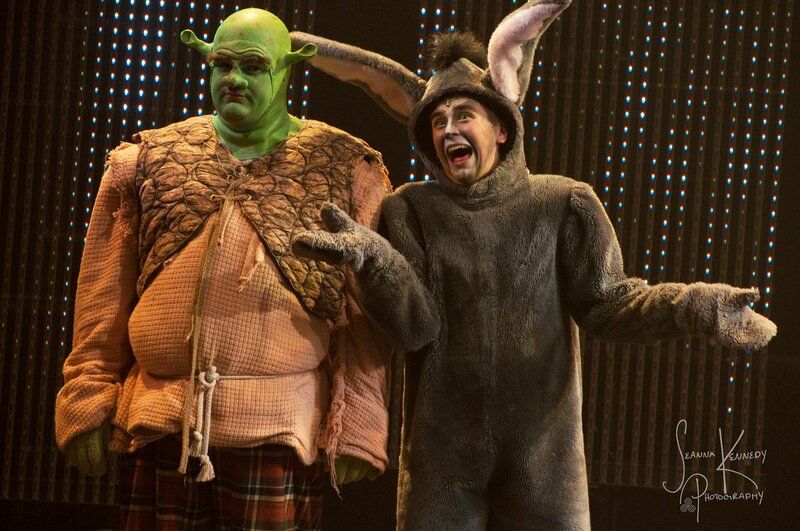 ADR: When I found out the LOT was doing Shrek The Musical, it was a done deal. I walked into that room and I was like “I have to get this part and I will do anything for this part!” It’s one of my dream roles. BK: And it’s one of your dream roles too, Michelle! MN: Yeah, it’s funny. 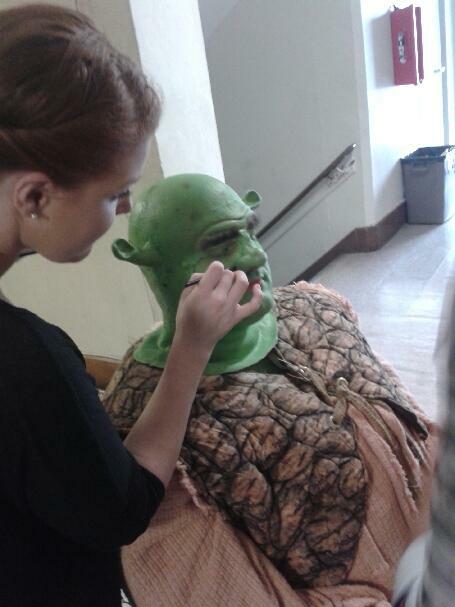 We used to talk about Shrek in school, and we were obsessed. It’s just so funny that it actually happened in such a great way. BK: When I saw the casting I was like “I die…this couldn’t be more perfectly suited to the two of you”. ADR: And we swore we would play these parts together. Like a joke. 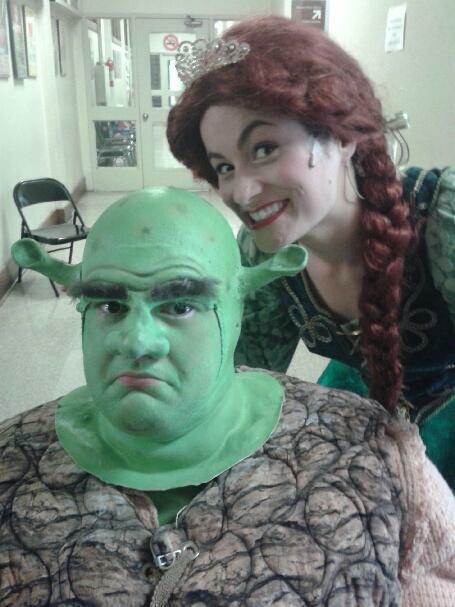 One of those “Michelle, one day it would be cool to be the Shrek to your Fiona.” And then literally a year later I get to fall in love with her every night. BK: And how is the falling in love? How’s being on stage as friends together? MN: It’s easy. We both trained at the same school and know where each of us is coming from. We both just feel it. It’s almost like a scene study every night. BK: What is the play like? People might expect it to be like the movie. How does it differ? Will their expectations be altered when they see it? ADR: The character development is so much stronger than in the movie. You are much more invested in the characters. The songs really do that. MN: The fairy tale characters are so minor in the movie, but in the musical, they’re very relevant. They are completely three dimensional and fleshed out. ADR: They carry the message of the story. There are so many characters you gloss over in the movie, which is the opposite in the play. BK: Talk to me about your director Seanna Kennedy? 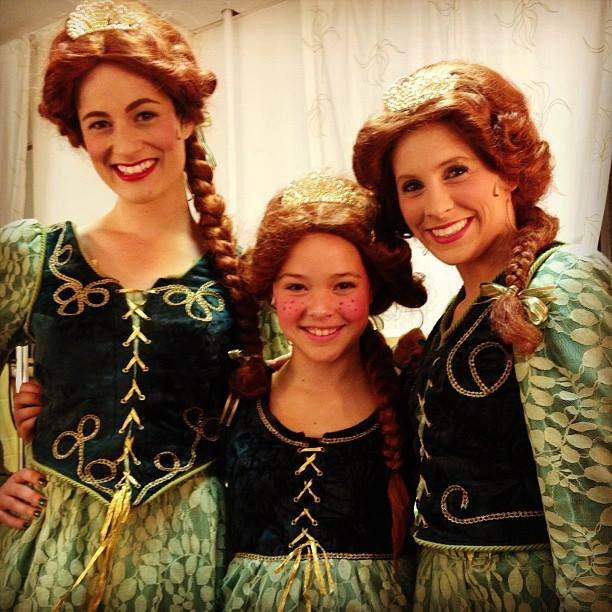 MN: She specializes in children’s theatre, but this show is more than that. This show is really for the kids and she really catered to that. We have such a good team coming together to create the show. With us two, she knew how much we loved the roles and let us explore our ideas. She gave us such creative freedom. ADR: Because we know the roles so well, we got to play with them. 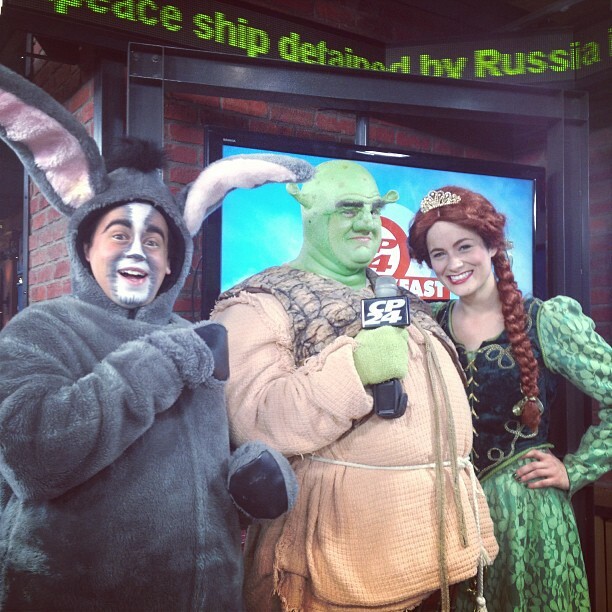 I feel so close to Shrek. I know who he is and what he wants and where he’s going and that’s important to an actor. MN: The only thing I struggle with secretly is the dancing. I don’t tap…well now I do! I’m so glad Seanna took a chance and gave it to me. I think she knew that as an actor, I could do justice to the role. ADR: The show for me is tremendously difficult. There are some tough songs. MN: He’s got fifteen ballads! ADR: Literally the second act is like ballad after ballad. Plus I’m doing a Scottish accent. Plus I have a mask on my head. BK: Yes, oh my gosh the make up! Tell me about the make up process? It looks so intense. MN: We had to get our facemasks done. Mine is a transformation in three minutes with a different wig, fat suit and a prosthetic nose. Andrew’s is a whole other story. ADR: They pull on a skin tight, foam rubber head that only exposes my eyes, cheeks and mouth. They spray paint my face green. For the first couple of times, I was a little scared. Later on, they drilled holes in the ears for better sound but it wasn’t enough. So I wear a transponder with earphones throughout the whole show and I hear everything! It’s like mini monitor. MN: And he can’t even take them out during the whole show. ADR: The sacrifices I’ve made for that head piece are so worth it because of how incredible it looks. I walk out on stage sometimes and people applaud. 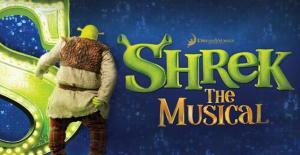 They’ve done a fantastic job with the costumes and puppetry in this show. BK: What are the best aspects of this show, for yourself and for the audience? ADR: The song right before Act One intermission called “Who I’d Be”. It’s the song that made me fall in love with the musical. MN: “Morning Person” is the song that made me fall in love with Shrek and I’ve used it for many auditions. Getting to do a song you do for auditions on stage is such an interesting experience. It’s such a difference to do it full out with props… it just completely comes to life, making it so satisfying to perform. BK: And for the audience? ADR: That’s the one that really gets the audience. It’s the moment when you feel that everyone is with you. MN: The song has farting and burping in it and once that happens people understand what the show is. It’s always a guaranteed laugh. ADR: You can feel the energy in the whole room. MN: Also “Freak Flag!” That song is one of my favourites in the show. All the fairy tale characters just come alive. ADR: It’s also that message that’s prevalent throughout the show – that you can be different. Embrace yourself. MN: There was one kid opening night that had down syndrome and during that song he just stood up and started dancing! It was an incredible moment for all of us on stage and in the audience. BK: The kids have to make the show for you. I’m sure they wait for you at the stage door. ADR: They love the show. They appreciate every aspect of it. There was this one boy who asked for every single character by name at the stage door wanting their autograph. BK: Kids are so affected by theatre and it’s incredible to see how much of an impression it makes on them. ADR: It’s what makes it worth doing this show every night. BK: Being an emerging artist, do you have any advice for your fellow actors? MN: I think we’re still trying to figure it out ourselves. ADR: Personally, holding back on getting an outside job right away helped me focus more. It gave me time to go out to every audition. Not having any anchor to a job is what helped me get these roles. I was always ready and willing with anything that came my way. MN: I have the opposite experience. I have a lot of jobs. I think it’s funny, sometimes I wish I didn’t have all of these jobs, but truth be told, living in Toronto is expensive! You gotta eat. Thankfully, I have jobs that understand what I do and give me time off when I need to do a show. But it’s hard. My advice is: Be accepting of the fact that for however long it takes you, you’re kind of going to be in the shits for a bit. You are going to be working so many jobs, but you can take things out of every experience. With serving, for example, you learn from all the different types of people that surround you and as an actor I’ve grown from that. Also, I don’t even have an agent yet. BK: Which is so interesting because you’re always working! MN: It just hasn’t been my focus right now because I’ve been so busy with shows. I take any opportunity that comes my way. And I’m still alive. I have a roof over my head, which is all I really need. Young actors need to understand that you’re aren’t going to have a lot of money for a while. ADR: You’re going to have to work hard. Network. Listen to others. Pay attention. And be unknown for a very long time, which is a different feeling coming out of the small community that is theatre school. In this industry, even if you think you’re the greatest…you still have to put in the work. MN: Even with the LOT, I’ve done five shows with them. This is first time I’ve had a lead. I’ve had to work hard and dedicate myself. MN: The Real World Challenge or Top Chef…Love my Reality TV. MN: My drama teacher in high school told me, you’re going to be poor and in debt anyways so you might as well choose where you want to go. I kind of live by that. ADR: Holger Syme from our university, UTM… He said go out there and see other people’s work. People won’t come see yours if you don’t see theirs. That’s how our community is going to thrive, by supporting each other.